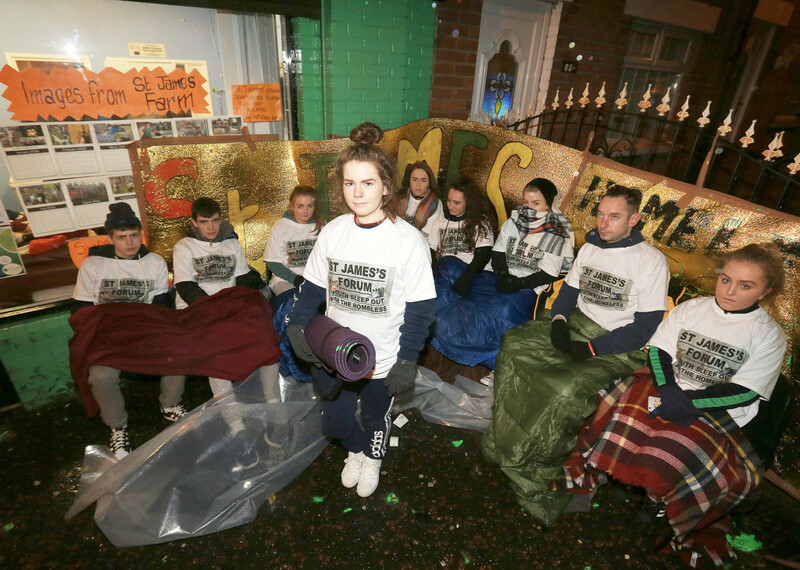 A group of big-hearted young people from the St James’ area slept out overnight to raise money and awareness for the homeless. This act of compassion and generosity came just days after another homeless person died in the city. The young people raised £820 which will go towards providing sleeping bags and keep-warm packs for the homeless in Belfast. Community worker Damian Lindsay said: “The young people from St James’ Forum have been working alongside the St James’ Swifts team delivering keep-warm packs to the homeless in the city centre. Their idea was to raise awareness as well as fundraise. Some of the young people who stayed out overnight have spoken of their experience. “This sleep-out we did was to raise awareness for the homeless, it was a really good experience to see what the homeless people actually live like,” said Caitlin Kane (15). “A cold Friday night with all my friends raising money for a good cause was such an experience and a lesson in how it feels to be homeless,” said Bronagh Austin (17). “I thought it was very tough and challenging and gave us an insight into what people have to face 24/7, the community were very supportive, it was tough but worth it because we raised so much,” said Cora Burns (16). On Thursday evening an emergency meeting was called as homeless groups came together to discuss the growing scourge of homelessness. People before Profit’s Gerry Carroll attended and he said: “People from a range of organisations gathered at the meeting on Thursday to discuss if more could be done after the tragic deaths of homeless people in the city over the last few weeks. “The meeting had a range of volunteers from homeless organisations that do invaluable work in supporting those who are forced onto our streets. It was discussed that more activity and co-operation could happen between these groups to ensure the best help is made available. “There was also a real sense of frustration in the room at the lack of activity by the Executive and the political parties to address homelessness – buildings are lying empty, homes are lying empty, yet we have people lying at shop fronts and dying in the freezing cold.